saying "maybe later" to them when I actually mean "NO, not ever in a million years". Of course, I am not guilty of all of these things ALL THE TIME but yes, there are times when I am just "not in their world". However, lately, I have been spending less time with them due to insane work commitments and it has made me appreciate them more and want to be further immersed in their world. I'm finding our cooking and craft sessions can actually be lots of fun. Barnstormer often comes out with amusing comments, many of which I will never remember, but she loves to pepper her conversation, wherever possible, with four and five-syllable words she has overheard. She does this with perfect pronunciation and everything is used in the right context. I'm also spending much more time reading stories to them at night and it no longer seems like the last chore during nutcase hour. In fact nutcase hour seems to be morphing into quite a pleasant "dinner time/bath time/bed time" situation. Storytime is now an enjoyable activity and I am amazed at their memories when we select books we haven't read in a year. How does Barnstormer remember the names that I made up of the background characters? How does Hammerhead remember the text word-for-word on the pages that have been ripped out by Mr Nobody? 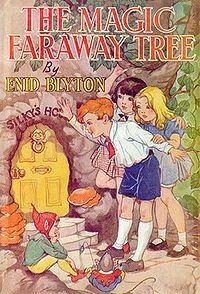 I've even gone to the supreme effort of MAKING UP STORIES out of my head about two fictional characters, who may or may not be based on Hammerhead and Barnstormer, and a magical far away tree that may or may not be based on The Magic Faraway Tree. I'm now finding that through this medium I can weave in little life lessons (some may call it brainwashing) about improving their behaviour. Stone the flippin' crows: Did you know that the gorgeous Marcus Graham is now on Home and Away? Flamin' heck. Actually, it's almost got me hooked too. I seem to have wandered off topic here so I'll wind it up. My message was simply that I have learned to appreciate the little people a little better now that I have truly acknowledged the depressing fog that has been present. I'm not going to feel guilty about the times that I was not in their world as I know that there have also been MANY, MANY quality times where I have been in their world. For now, I am focused on staying in their world and enjoying all the things that bring them joy. I love to watch Hammerhead's grin turn to that massive smile as we conjure up yet another magic potion out of lizard poo and ladybird's wee just before bedtime.